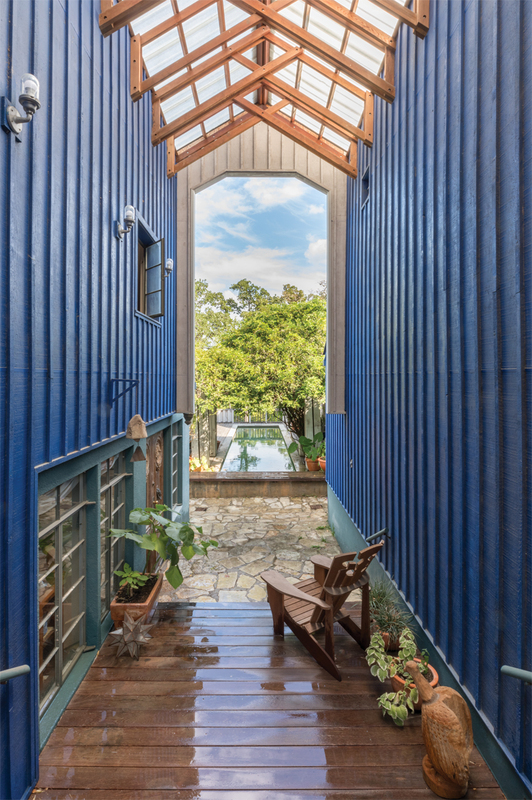 The Moore/Andersson Compound has received the Texas Society of Architects 25-Year Award. Charles Moore, FAIA, would be touched to know that he shares this distinction with the Kimbell Museum by Louis Kahn, an architect who meant so much to him, and for whom he served as teaching assistant at Princeton. Moore would also be honored to join O’Neil Ford on this roster, as he came to Austin as the first occupant of the O’Neil Ford Centennial Chair in Architecture at The University of Texas. Since Moore designed a new house — this would be his seventh — and started a new practice everywhere he moved, Moore asked Arthur Andersson to join him. (They had been working together on the 1984 World’s Fair in New Orleans.) Each one of Moore’s houses was extraordinary; each one a further elaboration of a set of ideas and images that first took shape in his 650-sf Orinda House, built over the hill from Berkeley in 1962. Moore and Andersson’s compound of dwellings and studios is tightly planned but casual in feel. It is a metaphor of a village that has as much to do with Spanish courtyard precedents of 18th-century Texas as it does with middle European ranch cottages and shacks of the Hill Country. The overall theme is how reticent, crisp shells can utterly thwart the expectations of those who step inside and discover spaces of dazzling complexity and invention. It is a place simultaneously prosaic and exotic, full of the most extraordinary layers made of the most ordinary materials. On one side of the courtyard pool, there is Moore’s house, with one encompassing space arranged along an interior, elliptical palisade, whose every surface is arrayed with colors, patterns, books, and folk art. On the pool’s other side is Andersson’s white house, with a library inhabiting a “cliff dwelling” and sharp, telescoping shifts in scale, from a monumental styrofoam model of Borromini’s Oratorio dei Filippini down to a tiny an-tique doorframe. An architectural studio acts as the fulcrum for these two spaces. One roof somehow resolves all of the restless geometry within. Texans should be proud to have this national treasure in their midst. Kevin Keim is director of the Charles Moore Foundation.